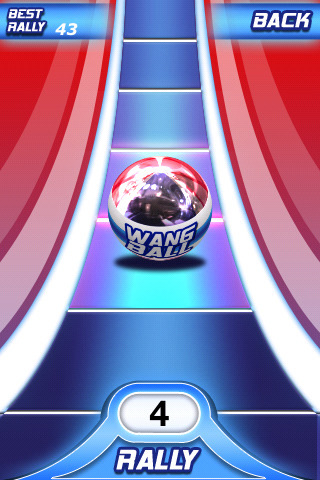 Wang Ball is a game app. by Fuzzy-Frog Games where your purpose is to shake/flick your iPhone or iPod to hit a pinball (Wang Ball) away from you. After you hit the ball, it comes back, and you have to hit it again. Repeat indefinitely. You can play in “Rally Challenge” mode to practice hitting the ball and to try and beat your own record, or you can play in “1P VS 2P” mode against other Wang-Ballers. As a disclaimer, I was never able to play in player against player mode, as my device could not connect with any other players. I tried many different times in different locations to connect with someone, but had no luck. I don’t know if this was a problem with my device, or if nobody else is playing Wang Ball. I was very excited to play this game, initially because the name was fun and silly, and then after entering the game I saw that there is a warning saying that Fuzzy Frog is not responsible for any damages caused to devices by using this game. This reminded me of playing the Wii, and all the stories I heard of people throwing their controllers accidentally while caught up in the excitement of a game. Since I love the Wii, I thought I’d love Wang Ball too. Sadly, I was wrong. Basically, the app. is boring. I don’t know how else to say it. In the “Rally Challenge” I only got up to 18 hits- not because I couldn’t do more, but because I just didn’t have the desire to play anymore. I think new features need to be added to make the game more complicated or different in some way. I usually like repetitive and simple, but Wang Ball takes it too far to the extreme, so it just seems a little pointless. I will say that I like the look of the game. The Wang Ball is reflective and spins in place before you start a rally, and the white/red/blue/silver color scheme appeals to me. I like that the Wang Ball pathway is segmented and that each segment lights up as the ball is passing over it. When the ball is hit really hard, a line of purple/pink/aqua colors appears on the pathway that I like. I enjoy the sound effects, the countdown, the “Let’s Wang Ball” that appears after the countdown, etc. Basically, I enjoy everything except the game concept itself. It needs to be more involved. Keep in mind that Wang Ball is free, though. And if there are other devices that you can connect to, then you may enjoy your experience more than I did. If you are into repetitive, simple games where you can compete against yourself, then I’d say you’re a Wang-Baller! AppSafari review of Wang Ball was written by Tyne Kennedy on April 6th, 2010 and categorized under App Store, Fun, Games, Physics Based. Page viewed 4184 times, 1 so far today. Need help on using these apps? Please read the Help Page.